Check Our Out Great Selection of Bunkhouse Travel Trailers! 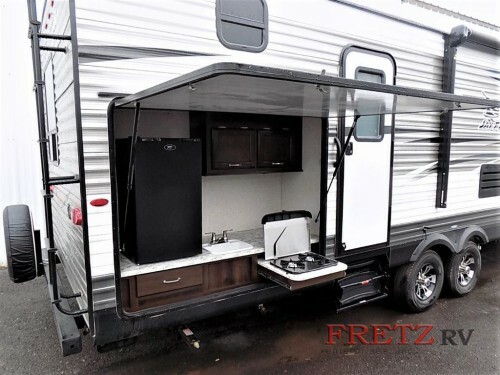 At Fretz RV we always have numerous bunkhouse travel trailers for sale in order to provide the best selection of family friendly RVs available. Whether you have a large family or just love bringing extra people along for on your camping trips, our bunkhouse floor-plans can fulfill your needs. Take a look at a few of the bunkhouse floor-plans we have in stock for you. Find the perfect family RV with our Bunkhouse travel trailers! 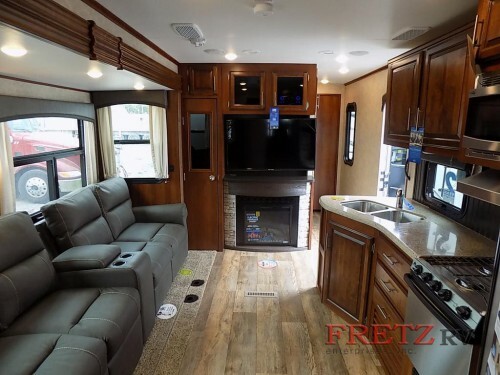 In the Jayco Eagle 333BHOK, you will be getting much more than just a bunkhouse floorplan. 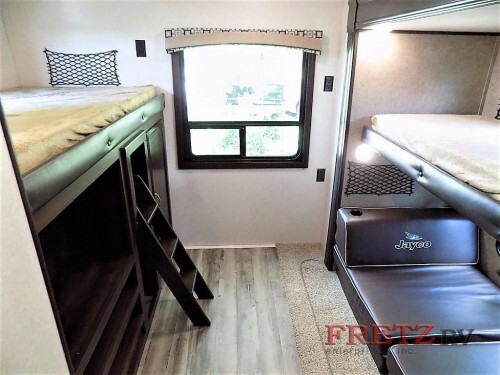 This triple slide model will come with not only a rear bunkhouse complete with gamer chairs but also have plenty of other sleepings spots for up to eight people. 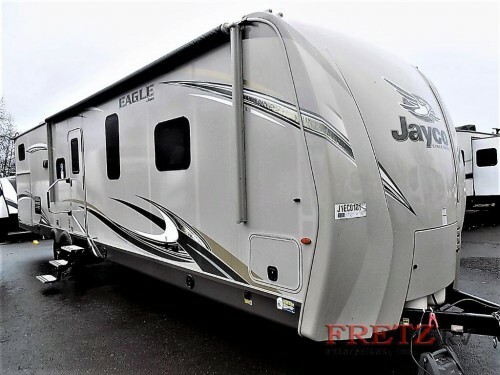 Enjoy lots of extras in the spacious Jayco Eagle 333BHOK Travel Trailers. You are certain to love the extra amenities scattered throughout the interior that are intended to keep everyone comfortable for any length stay. With items such as an LED fireplace, washer and dryer prep station, and Climate Shield zero-degree-tested protection, no matter the length of stay or where you are, you will be taken care of. The kids in the group will love having their own bunkhouse. Another bunkhouse model that you should check out is the Jayco Jay Flight 32BHDS. Although this option only comes with two slides, one of them will be an extra large slide in the main area with enough space for both a convertible U-dinette table and sofa. These items plus the rear bunkhouse complete with TV and wardrobe space will make room for up to eight people as well. Never be far away from a snack with the outside kitchen. And you will love the convenience that comes along with this RV! The dual entries provide one private, easily accessible entrance directly to the bathroom, and always be within reach of a snack with the extra outside kitchen area complete with fridge, sink, storage cabinets, and 2-burner cooktop! These are only a few of the bunkhouse travel trailers we have for sale at our dealers. Be sure to come on by or contact us today to find out how you can start RVing in style with your family and friends!